The first one is one of my favorite looks of yours, if not my favorite one! I love the boho inspired outfit on top. It looks like you just returned from Coachella :) Btw, you should definitely wear those shorts more often. They look so cute paired with the casual blouse. Leopard rules! Love that scarf and works well with the red dress. I think that both looks are fab and the stylist chose right with that hue of blue. Do you think your style has evolved after the stylist session? I think I've definitely got more confidence - there's nothing quite like being told that some of your favourite outfits just aren't doing you any justice, and hearing lots of praise for those things that you were on the fence about. it's been eye opening, and it is definitely making me try more combinations inside my wardrobe. Shorts in fall?! I'm jealous. That's near unheard of here. Regardless, it looks lovely, and I really like that bag. It's different, more simple and understated which is a nice mix. I'm so basic with my handbags. I have one of each style (except bucket, I just don't get it). hehe yes I took advantage of that hot spell to wear those shorts! they are packed away for warmer months now! You need to hand over that cognac bag Mica! It is too sharp! I love you in blue. The print of your shorts are pretty and I love that crisp white shirt with it. Sometimes you just have to go with impulse purchases. It worked for you. I was just thinking I hadn't seen that first bag before reading that you hadn't worn it in awhile. You need to do a post about how you store them all! You have such a good collection. I have a video on youtube of how I used to store them: https://www.youtube.com/watch?v=Y_mqsKFWV1E I have so many! They are all in boxes under the bed now, my wardrobe room became baby's nursery. You know sometimes impulse buys can become something that stays in your wardrobe forever :) I have this happened to me (the outremer Balenciaga and my bal moto jacket). Anyway I was gonna tell you that you have really nice legs but then it may sound kind of creepy (but I already said it so oh well lol). The first look, amazing! I mean you are lucky to be able to still wear that during fall months (which I miss) But that second look is so me!! I just love wearing things like that very comfy but still very chic! 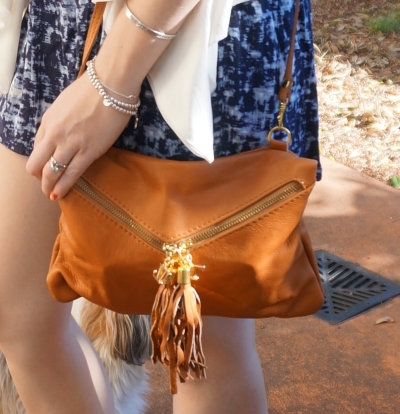 Beautiful outfits; you have the coolest handbags. love the first look, such a nice jacket! Gorgeous outfits!!! I've never been much into scarves but I must give them more chances!!! Legs for days in those shorts!! 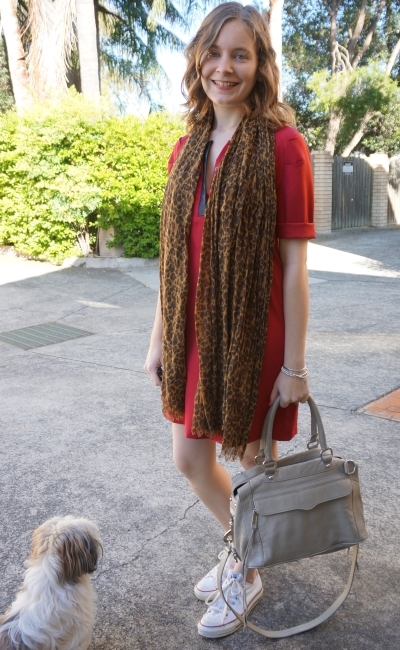 I think you nailed it with the red dress and leopard print scarf! I love it when an impulse purchase pays off! It was for real worth the money, Mica! Great catch! I love the "vamp meets streetstyle girl" vibe! So in love with your leopard scarf! Awesome combo! Jelly of your long legs, dear! ;-) They look even longer with your "skin" colored Pistols! Antother look which reminds me kinda of Isabel Marant! Beautiful and very inspring! Happy Monday, Mica! I love the first outfit. I’m jealous you can still bear your legs at this time of the year. It’s freezing here! I love really like the boots with those shorts. Perfect. Really love the first outfit! The shorts look great on you! You look so chic in the 1st outfit. Love the first look, that purse and necklace are beautiful. Great styles! These photos are so captivating, you always look so pretty and attractive. Have I ever said that I love your curly hair a lot:)? This hair style suits you perfectly well, indeed. Both of those outfits are so womanly and effortless, which is so nice. I am loving that dress in the second look. It seems so effortless! I'm so jealous of your bare legs! Both of these outfits are adorable! That little white shirt/jacket is such a statement piece. It really pops against the blues! And I'm a sucker for red+ leopard print. Thank you all for your kind comments (especially about my legs! ).